The “Zukunftsbar”, a new networking platform initiated by the Technology Park Heidelberg and BioRN cluster attracted experts ranging from academia to industry to create new synergies for future. Interesting talks about the possibilities, short-comings and future outlooks of AI were held by Dr. Carsten Rother, the head of Heidelberg Collaboratory for Image Processing (HCI) and Dr. Jürgen Quittek, the managing director at NEC laboratories Europe. 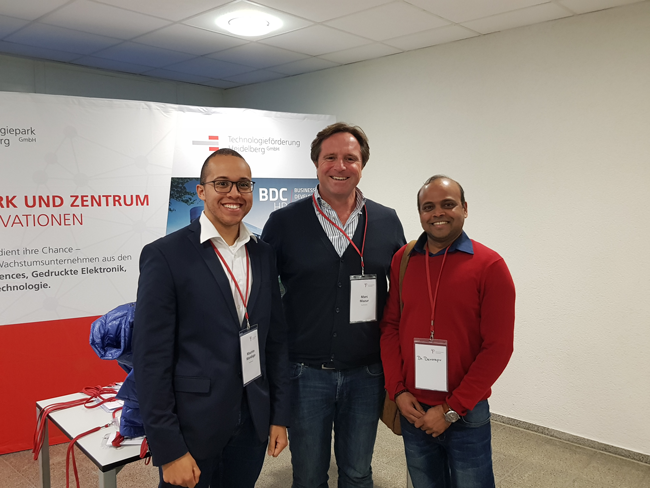 Marc Mazur (CEO), Satish Kumar Devarapu (Director Partner Management) and Maurice Mandago (Senior Scientist) took the opportunity to learn about current applications of AI in the pharma sector and network with partner companies. PreviPharma’s Medical Innovation Platform offers ways to identify new possibilities of using plasma proteins. Benefits for pharma companies include reduced time from idea to clinical trial and increased innovation success rates. 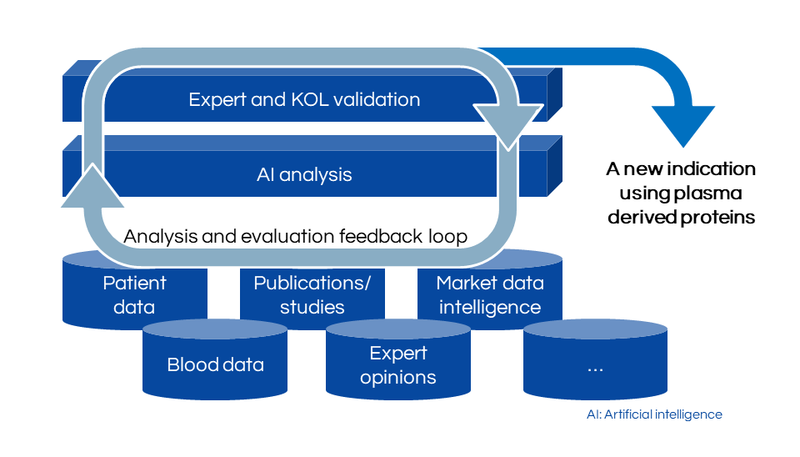 PreviPharma already uses Business Intelligence as pre-stage of an AI-approach for the discovery of new uses of plasma proteins. PreviPharma assesses new indications and “hidden gems” by using a feedback loop of data analysis and evaluation. The loop begins with the collection of literature from public domain, expert opinions, patient and market data and other sources of data. These data packages are matched and evaluated on the first level by AI to identify new deficiencies. Then, newly identified hits are evaluated by PreviPharma’s team of experts and key-opinion-leaders (KoL). PreviPharma has started an initiative to nominate important partners, whose innovations and technologies offer significant advantages to evolve and improve plasma fractionation. 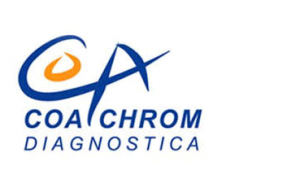 PreviPharma’s first pick goes to CoaChrom Diagnostica. CoaChrom offers a large and steadily growing portfolio of analytical methods focused on coagulation and fibrinolysis. CoaChrom’s test kits and reagents are used for early diagnostics in protein discovery projects in PreviPharma’s Medical Innovation Platform (MIP) and for protein process developments in PreviPharma’s Technology Innovation Platform (TIP). “We have found a very competent, innovative and reliable partner in CoaChrom. Their assays can be performed easily by our scientists, service quality is excellent and were already successfully transferred to customers around the world.” Marc Mazur, CEO PreviPharma. “We are pleased to work with innovative research and service companies such as PreviPharma. Within in a few years, PreviPharma’s MIP has grown into a complete set of services that we can support with our assay methods. We look forward to working with the PreviPharma team in many innovative projects.” Bernhard Kolmer, CEO CoaChrom. Furthermore, the innovative Thrombodynamics-4D system of CoaChroms partner company HemaCore allows a new level of understanding of coagulation and has been used by PreviPharma to evaluate the efficacy of newly-developed coagulometric and fibrinolytic drugs. To learn more about PreviPharma’s Medical and Technology Innovation Platforms and how we can assist you in designing or optimizing your desired fractionation process using state-of-the-art analytics, provided by CoaChrom next-gen technology, please visit: http://www.previpharma.com/. Visit also http://www.coachrom.com/ and https://www.thrombodynamics.com/ for more information. Visit of Dr. Stephan Kiessig (Chief Medical Officer PreviPharma) and Marc Mazur (Managing Director PreviPharma) at the Forum Rare Diseases, Berlin (November 2018).